Clyde Willis Daniels, 95, of Franklin, IN, passed away Monday, August 6, 2018 at Johnson Memorial Hospital in Franklin, IN. 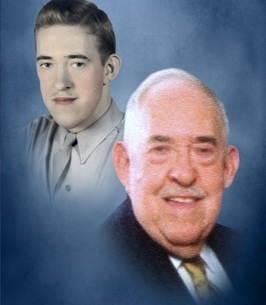 He was born August 7, 1922 in Pike County, Kentucky to Clyde and Mae (Baldridge) Daniels. Clyde graduated from Whitesburg High School in Kentucky and worked in the coal mines as a young man. He joined the U.S. Army Air Corps as a nose turret gunner and flew 35 missions in WW II in the European Theater. Clyde married Ferne (Williams) Daniels on April 22, 1950 in Letcher County, KY and they lived in Miami, FL for 30 years where he worked as an aircraft mechanic. In 1978 they moved back to Franklin, IN, with their daughter to be near family, he was employed at Holbrook Manufacturing & Welding for over 20 years. He enjoyed biking around his neighborhood, fishing, and reading. He was a member of Franklin American Legion Post #205. Survivors include his daughter Cindy Weddle and son-in-law Bart Weddle of Franklin, IN; grandson Daniel Weddle of Franklin, IN; and several nieces and nephews. Clyde was preceded in death by his parents; his loving wife Ferne (Williams) Daniels; his sister Mildred (Garnett) Craft; and a brother Herman Daniels (Norma). Bob Tolliver and Brian Tolliver will conduct a memorial service Saturday, August 11, 2018 at 10AM at Swartz Family Community Mortuary and Memorial Center, 300 South U.S. 31 (Morton Street) in Franklin, IN. Friends may call Friday 4-8PM at the mortuary. Burial will be in Greenlawn Cemetery with military honors being conducted by the United States Air Force Honor Guard and Franklin American Legion Post #205 Honor Guard. Online condolences may be sent to the family at www.swartzmortuary.com. Information at 317-738-0202.